Moab Rocks 2014 kicked of with a vengeance just after sunrise this morning. 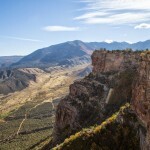 Just as the sun crested the majestic red rock cliffs around the world’s first mountain bike mecca 94 riders took the start with all eyes on conquering the 17-mile, 5,000 vertical foot climb up Sand Flats road. In contrast to 2013, this year’s Moab Rocks stage race started with the toughest 17 miles of the racing first. The race’s first stage travels from the valley floor, 5,000 feet up to the Upper Porcupine Singletrack (UPS) trail. From there riders descend UPS and Lower Porcupine Singletrack, before finishing with a punishing run down Porcupine Rim. An amazing test of mountain bike skill and fitness Moab Rocks drew a hardy group of dirt fiends from all across North America and even Europe. Race organizers provided quite a treat on some of the toughest trails found anywhere. Despite the difficult terrain close racing was the standard for the day. After a mass start the lead group slowly thinned out as the climbing got steeper and steeper. Travis Brown (Trek) took the lead and began pushing the pace around mile 10. Nate Miller (Honey Stinger/Planet Foods) matched Brown’s accelerations and the two opened up a gap toward the apex of the climb. Brown was first to hit the UPS singletrack with a clear path in front of him. Miller did his best to stay close but quickly started to feel the negative effects of riding a hardtail over the unrelenting rocks of the Porcupine Rim. Canadian Eric Tourville (Hype) was the first to catch and pass Miller as he displayed his mastery of the technical trails. Tourville moved from outside the top-5 on the climb to first on the downhill. In posting the fastest enduro downhill time of the day Tourville overtook race leader Brown just before the finish crossing the line just 1 second in front. Brown took second followed by Peter Watson (Balance Point) and Chris Holley (Kuhl). Miller held onto fifth keeping Holley and Watson in sight. For the open women it was Jen Hanks (Epic Brewing/MTBRaceNews.com) applying the pressure at the front of the race. Hanks surprised herself by climbing comfortably with a handful of men and reaching the top of Sand Flats in the lead position. Going into Moab Rocks Hanks wasn’t sure what to expect. This time last year she had just completed chemo therapy and was just starting radiation treatment for breast cancer. Saturday morning she was just happy to be on the start line at Moab Rocks. A podium finish would be an unexpected surprise. The Epic Brewing rider entered UPS in first, feeling comfortable and trying to stay smooth. The climb had taken a toll on the leader however. She struggled to stay efficient in the early miles of singletrack. That allowed Margie Smith (Wilson Sports) of Banff to catch the leader and take sole possession of first place. Once out front Smith continued to shred the descent putting time on all her rivals. The Canadian riders seemed to have the upper hand on the rough and rocky descent as Jennifer Schulz (Balance Point) was the next to set her sights on Hanks finally catching her just before the finish. Schulz currently sits 1st overall in the GC for the open women as Margie Smith is racing in the 40+ women’s category. Hanks sits in second on GC and is the only American in the top-5 with three Canadians following her. Pepper Harlton (Devon Bicycle), Katy Curtis, and Tannille Stickley complete the top spots in the GC. Tomorrow’s stage is new for 2014. Just over 32 miles stage 2 takes place on the Klondike Bluffs trail system. While still technical with plenty of slickrock Klondike Bluffs lacks the prolonged climbs of stage 1 and includes much more singletrack than day 1. With just seconds separating the top riders stage 2 is guaranteed to produce a ton action with lots of changes in the GC on tap. 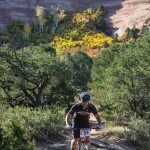 Tune in to MTB Race News tomorrow for full results, report, and photos from Moab Rocks. This entry was posted in Blogs, MST Time Zone, Ultra Endurance, XC Racing and tagged moab rocks, travis brown by mackyfranklin. Bookmark the permalink.